This quiz is testing your knowledge about the Harry Potter movies, I wish you the best of luck to succeed, but we'll see in the end of the test... I hope you will enjoy. We'll start of easy, which quote DIDN'T Dumbledore say in the movies? "Words are, in my not so humble opinion ,our most inexhaustable source of magic..."
"Yes, Harry, you're right, we're truely at Kingscross Station"
Who, in the 6th movie DID get cursed by the necklace? Which one of the following, was not a test in the Triwizard Tournament? Now let's try something more difficult: Who flees from the group as Harry was transferred to the Burrow? 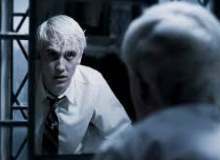 Who did the Elder Wand belong to right after Dumbledore's Death? Where did Scabbior bring Hermione, Harry and Ron after they find them in the Woods chasing Horcruxes? which one of the following names DIDN'T get killed by Bellatrix Lestrange? Who was Bellatrix to Narcissa? Based on who was Bellatrix to Narcissa, Who was Bellatrix then to Draco?